A common question clients who are advancing on their ITIL maturity have is how to move from a Category-based system in ServiceNow to a living CMDB. Many organizations that are switching from another tool into ServiceNow recognize early on that their current process and data structures, often held within dependent drop-down menus for Category and Sub-Category (I’ve seen up to 4 levels of complexity here), need to mature. Why? They recognize the power to shift from text menus that carry nothing but the name of the action or object to arobust object-oriented and relationship-richmodel of a full CMDB that can be used for robust reporting and troubleshooting. This is a large step, and is often daunting to an organization. The good news is that this is a maturation step, an upgrade in process and data that brings immediate benefits. It takes some focus and work, generally from a wide team of knowledgeable people within the organization, but it is wholly doable and achievable with a minimum of pain. The recommended first step is to have the team analyze their current data structure and pull out all ‘objects’, whether they be tangible hardware or software (discoverable things), or intangible Business Services that serve as an umbrella term in an organization for clusters of services that tend to be referred to as one ‘thing’. These tend to be the ‘nouns’ of their structure, the objects to which things are done, to which things happen, and so forth. What they tend to be left with in their old Category lists are the ‘verbs’ or actions that are taken against (or happen against) those objects, for example items such as ‘Reset’, ‘Install’ or ‘Decommission’. Thus, everything that is an object, whether it is tangible (Exchange Server 03) or intangible (Email Business Service), will be a Configuration Item (CI) within ServiceNow. The second step after these items are entered into the CMDB via Discovery, Import or manual creation, is to build out a holistic understanding of your environment’s complexity of dependencies between these CI’s. This will be done by leveraging the objects that then be used as a node in a ‘tree’ of relationships with other CIs. 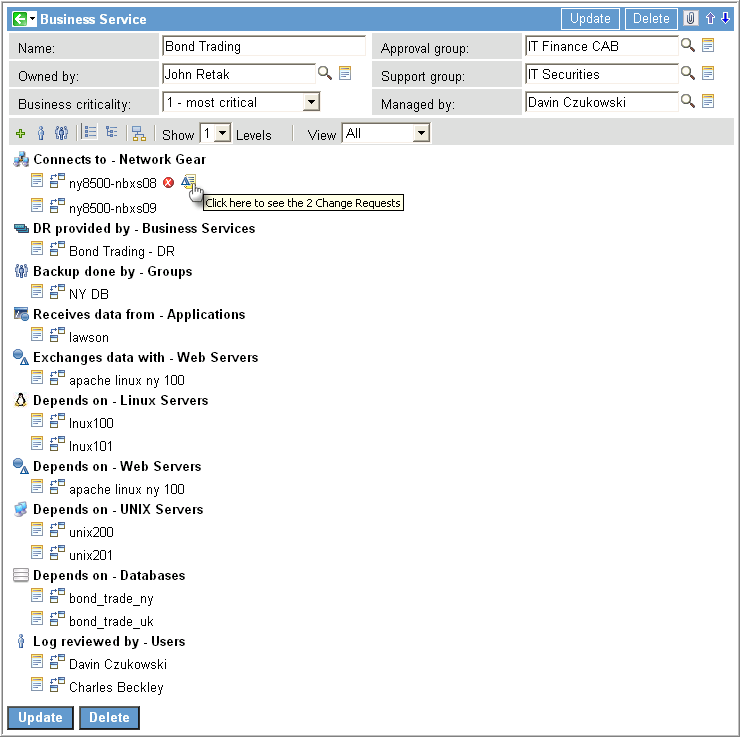 After those relationships are built between the CIs, the ServiceNow platform can leverage that data to power automatic notifications to subscribed parties, it can show your Service Desk technicians that a downstream CI is currently impaired, which can increase your first-call resolution and cut down on the amount of ticket duplication, as well as a host of other ready-to-go functionality already built into the system. The largest benefit from a CMDB-based system, over a Category-based system, is that the information is not hard-coded into fields on a table. It is living data that can be managed by separate teams, those closest to the information and responsibility of those CIs. This is related to the fact that Category changes would entail Update Sets, a testing process and in most organizations, a Change Request or Release process to promote those changes to Production. With a CMDB, those responsible for the data can be delegated the authority to keep that data up to date, if the organization does not leverage Discovery to do so automatically. The #ServiceNow platform leverages the CMDB throughout the entire platform, tying together Applications such as Incident, Change, Asset Management, Outages, and even SLAs and Schedules such as Change Management windows and Blackout calendars. Such a level of integration, to be achieved with Categories, could take months of custom development by a team, and could be prone to complexity and ‘fit’ issues over time. An organization will realize more benefits, more quickly, by maturing their environment to rely on the CMDB underpinnings of ServiceNow than by continuing to use the Category-based reporting and routing structure. Therefore, being able to immediately leverage built-in functionality within the platform, using relationships built onto that layer of objects that the organization cares about, which will increase understanding of impact, dependency and history. Categories cannot deliver this depth of knowledge to those making decisions affecting your business, whereas ServiceNow is already poised to take you to the next level of maturity in ITIL processes.